This huggable plush ostrich from Wild Republic's Cuddlekins collection has a wonderfully cuddly body with soft and fluffy black and white "feathers," floppy wings, tan feet, neck, and head, and a peach beak. Take a peek under those fluttery black lashes and you'll find warm brown eyes on this sweet ostrich stuffed animal's face. 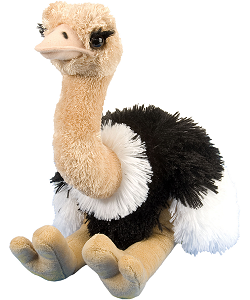 A portion of the proceeds from the sale of this adorable Cuddlekins stuffed ostrich helps to provide housing and education for disadvantaged children, as well as protection for abandoned animals throughout the world. Fun Facts about Ostriches: Did you know that ostriches live in small herds and that all of the "lesser" hens (females) place their eggs in the nest of the dominant hen? Then she and the alpha male take turns keeping all the eggs warm. This sweet baby rhinoceros has a huggable body covered in soft gray fur, a fluffy black tail tuft, and cream accents.